Just because this satay sauce is truly authentic doesn't mean it isn't easy to make--you simply mix all of the ingredients in a blender or food processor and adjust the seasoning and you're done! While most Western versions of satay sauce are made with peanut butter, this one starts with real peanuts - and you'll taste the difference! 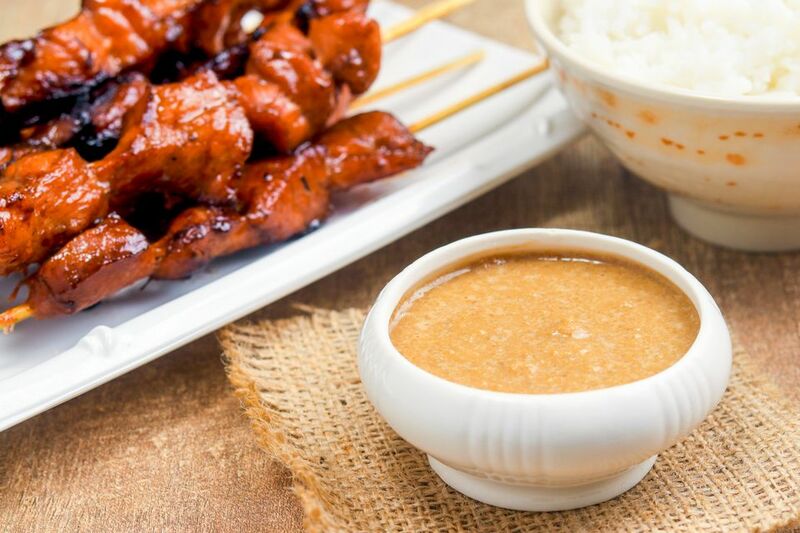 Satay sauce can be used for a variety of purposes, from a sauce for chicken or beef satay to an Asian salad dressing to a dip for fresh spring rolls. Or use it to make a delicious cold noodle salad or as a marinade for grilled chicken or tofu. Blend or process until sauce is smooth. If you prefer a runnier peanut sauce, add a little more water or coconut milk. Do a taste-test. When doing a taste-test, add more fish sauce (or soy sauce) if not salty enough. Add more cayenne if not spicy enough. If too salty, add a squeeze of fresh lime juice. If you'd prefer it sweeter, add a little more sugar. If you want to make the sauce vegetarian simply substitute soy sauce for the fish sauce. This sauce tends to thicken as it sits - just add a little water or coconut milk to thin it out, as needed. This satay stores well if kept covered in the refrigerator up to 2 weeks; freeze thereafter.